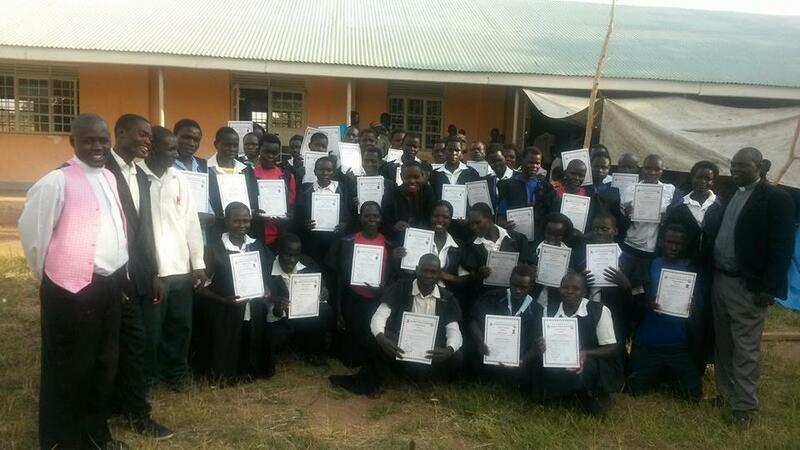 Another 43 graduated with vocational skills! The Technical Institute at Ngariam is continuing to thrive! TDT has been supporting the running and development of this college for 2 years, which equips young people with the skills necessary to find work. During the past 12 months it has provided training in tailoring, joinery and bricklaying to a further 43 students. On 3rd October a wonderful graduation ceremony was held to celebrate their achievements. These young people will now take their place as working members of the community, and help the development of rural villages in the area. The huge effect of the college is clearly seen in the communities when graduates start to generate income and contribute to the local economy. It was great to discover, on a recent visit to Teso, that this is already happening. The head-teacher reported that students who graduated last year have already been making and selling items in the local markets. We are looking forward to hearing more about how this college is helping to bring social and economic development to this area. Rev Sam Ediau (Church of Uganda Diocesan Education Officer) comments on this – PRASIE GOD! Congratulations to all the students and staff at Ngariam Technical Institute. Previous StoryDramatic improvements at Ngora Fred Carr Hospital Next StoryAteso Bible Revision Team Completes 7 books!